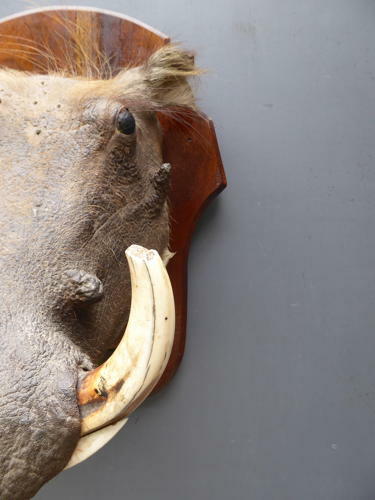 A large antique taxidermy warthog mount. A fantastic early piece, lifelike, bursting with character & with a wonderful set of tusks. Mounted on a large solid mahogany shield finished with a brass plaque engraved, 'John Heathcote Jun Esquire' (Possibly the son of the famous Victorian inventor & MP, John Heathcote). A handsome chap, likely to cause a stir wherever he goes! Wear commensurate with age, good solid condition overall with an area of skin loss to the snout & some old stitching to the right hand side. All part of his past & does not detract.